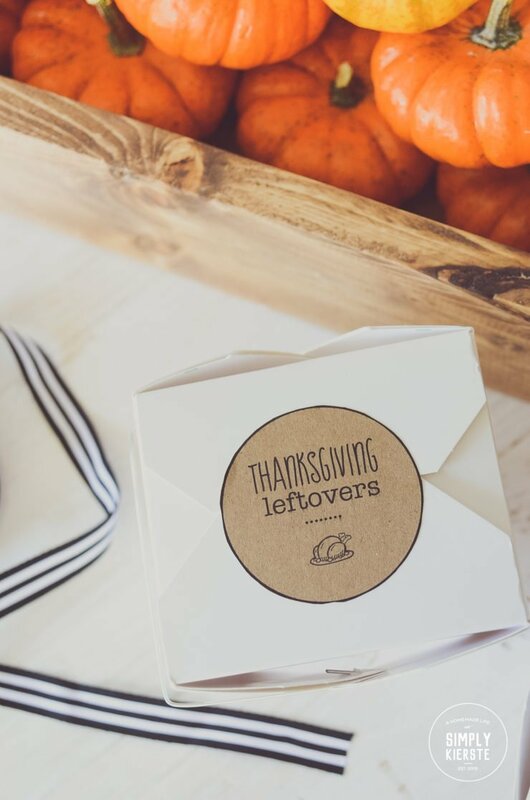 Adorable Thanksgiving Leftovers Printable that’s perfect for adding to all the leftovers for your fridge, and to send home with your guests! We’ll probably agree that Thanksgiving leftovers are almost better than the actual meal itself. There’s nothing like pulling out leftover turkey and cranberry, piling it on top of a fluffy roll, and eating it with a leftover piece of pie the day after Thanksgiving. It makes my mouth water just thinking about it! 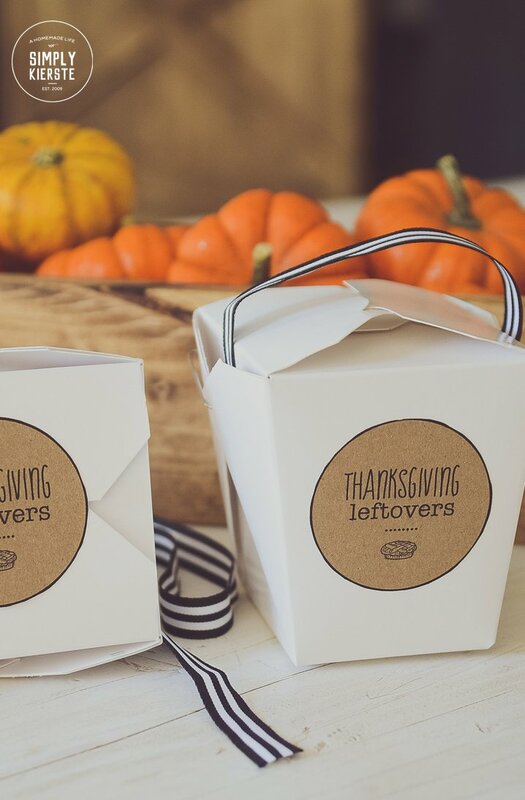 When you’re boxing up your leftovers for your own fridge or to send home with your guests, adding these darling tags makes a super cute and organized package. 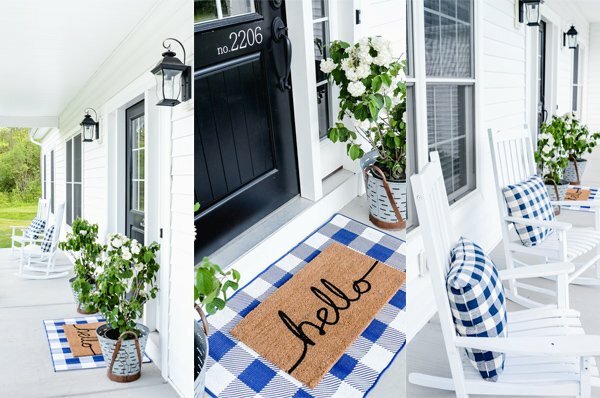 There’s room to add a date and even what’s inside! Affiliate links are included below for your convenience. 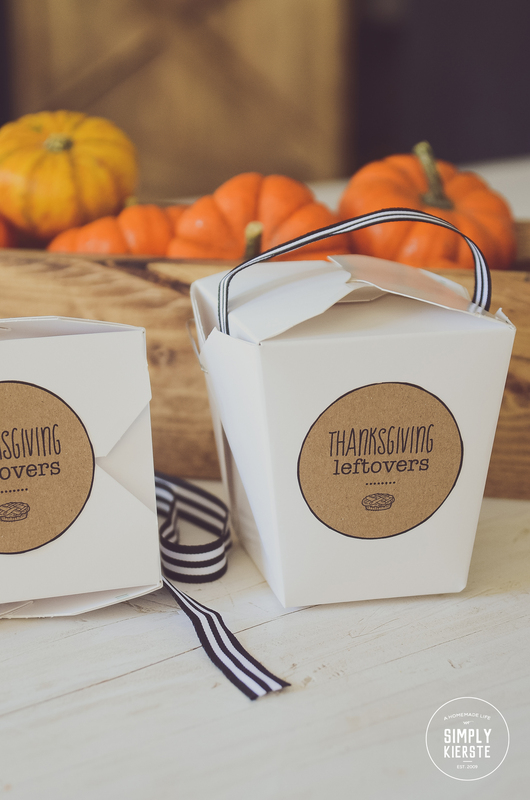 I love using takeout boxes, and I usually have some in white and the kraft color on hand, and I use them for so many things. 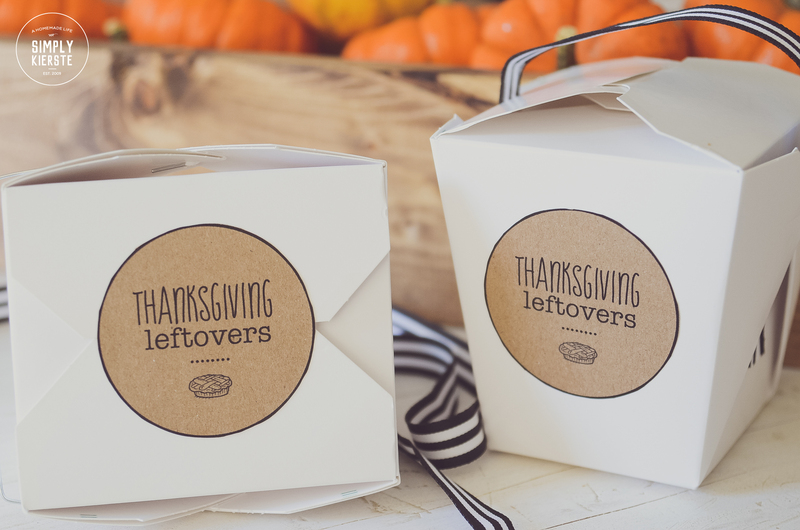 They’re perfect for Thanksgiving leftovers, especially for sending home with your friends, family, and guests. I also added a piece of ribbon for a handle, using a couple of pieces of double stick tape to hold them in place. Takes just a second to do, but makes it look SO SO cute! I used adhesive backed kraft card stock by Silhouette–it makes it so easy to stick the tags on, and I don’t have to worry about tape when I’m packaging everything up. I just print right on the card stock, cut out the circles with scissors, and then I’m ready to use them–just peel off the back sticker and I’m good to go! 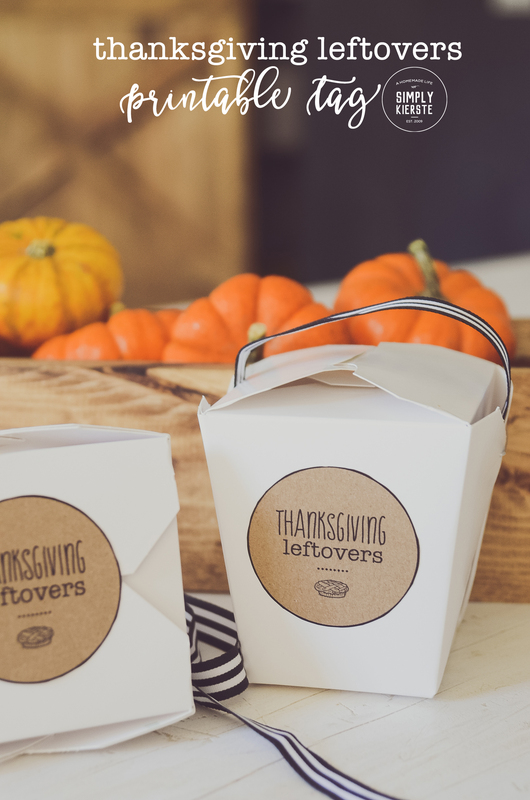 You can also use regular kraft or white cardstock (if you’re using white takeout boxes), just remember to have double stick tape on hand! Click on the link below to download the tags, print, and cut! 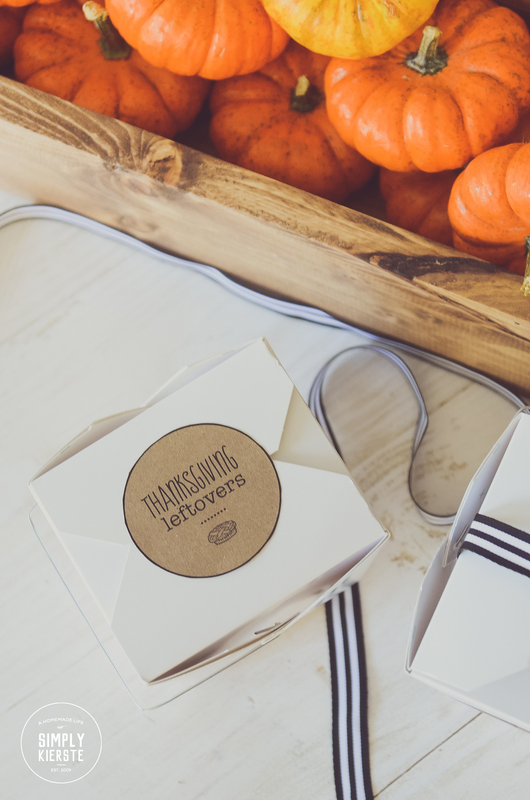 I’ve got two tags to choose from–one with with a cute pie, and the other with turkey! I love your ideas! Thanks, Kierste! I happen to have a bunch of those takeout boxes so am totally using this idea.